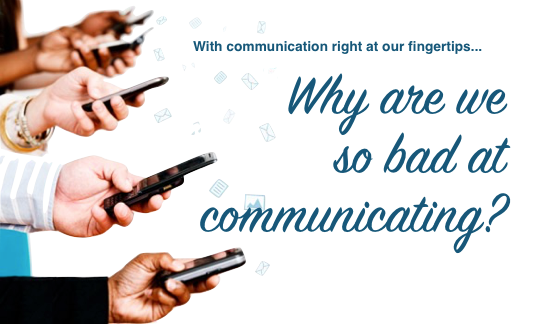 Communicating: Why are We So Bad At It? I recently was asked to give a few words of encouragement at a gathering, and I had the choice of whatever topic I thought would be most helpful. I chose to speak about communication to the young man we were there to honor, as well as the adults of varying ages in the room. It struck me as I was speaking that my advice was no different than what I tell the people who entrust their business and personal development to me. It’s also a perfect way to underscore that, as someone who is looking to relate to people in a successful way in business, it’s ALWAYS personal. 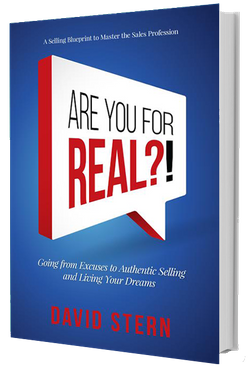 Who you are authentically can never be faked - you can’t remain one way as a person, and think that you can put on a false front when talking to clients, customers or coworkers. They will see right through you. I explained to everyone that whatever is happening in life — good, bad or indifferent — we need to recognize the importance of communicating it, and doing so in an appropriate way. Likewise, I counsel clients to develop honesty in their communications with clients. The news won’t always be good, or may make people feel uncomfortable, but with great care, discretion and thoughtfulness, open and honest communication is always the best course. You will be respected for it. More importantly, you will gain the trust of those around you. So why do people have trouble with communication? • They feel others should know what they need. Really, that puts unrealistic expectations on everyone else. No one is a mind reader. • They are too focused on the wrong communication. When it’s a complex problem, you need to use your smartphone to make an actual phone call and speak to someone in person. A quick text is a little communication, but it may as well be none at all, or do more damage. There is no replacement for face to face communication, yet people don’t value it as much lately. • Stress - maybe you figure other people don’t need to know your struggles or you feel sharing a problem is a burden. What ends up happening is that internal stress manifests as you being preoccupied, short-tempered, or hurried. If your customers, coworkers or friends don’t know what’s on your mind, it can be damaging to your rapport. In sales, it can be damaging to your bottom line. • Missed goals or objectives - when people don’t know what your goals are, it’s going to be impossible for them to help you achieve them. I think people assume their thoughts can be read, and get frustrated when others don’t understand what they need. You can never go wrong with sitting down with your team, your family — whoever it is you need to collaborate with — and expressing your ideas, needs and goals. • Health - So guess what? Because you’re dealing with added stress, and not meeting your goals, your health is going to suffer at some point. Of course stress can affect you mentally, and make you irritable or withdrawn. But your physical health can also suffer while you create these stresses, including headaches, stomach problems and the like. So, start practicing good communication first with the person in the mirror - YOU. Be honest with yourself, look deep, and be bold enough to admit where you see there are things that need to change, and where you might need help changing those things. It’s a scary journey — I know, I had to take one of my own when things were spiraling down for me in business. The discomfort and pain of the journey will be well worth it — it certainly was for me. Being dishonest with yourself is similar to keeping a secret or hiding bad news. It’s about pretending you are someone you’re not, and being fearful of people finding out. It’s putting forth one face, and meanwhile struggling internally with things you want to change but don’t seem to know how to, or even disliking the person you are. It’s a war you won’t win, and it will bring down relationships around you. The good news is that you don’t have to battle with yourself, you can enlist a trusted group that will help you — kindly — develop self-awareness. This is how other people see you. It’s often different than what you believe you’re projecting as a person, and understanding that difference is the first step toward positive personal development. I often tell clients to use a mirror and role play to see what they look like when, for example, they’re making a pitch to a customer or perhaps applying for a job. Their body language, facial expression and tone of voice is seen and heard through that mirror, and the results can often surprise people. It’s a tough exercise because even though people know it’s a mirror, it’s also enough of a different perspective that they will say “I had no idea I made that face” or “I can’t believe how much I look down at the floor when I’m uncomfortable talking.” They’re looking at themselves through different eyes, and sometimes they don’t like what they see. Communication with someone who isn’t there just as a critic but as someone who can be a sounding board with encouraging insights for you to try different tactics in how you interact with others is invaluable. As a coach, I also offer more objective feedback than say, a close relative or friend. When you remove the emotion from the process of personal development, you yourself can see your strengths and weaknesses without the drama. As I mentioned, while I was speaking to a young man at this event, I also realized the room was full of people of all ages. But I also realized that the message was ageless. Be open. Be honest. Never stop communicating, and always communicate with respect and discretion, especially when the person you’re talking to is the person looking back at you in the mirror.